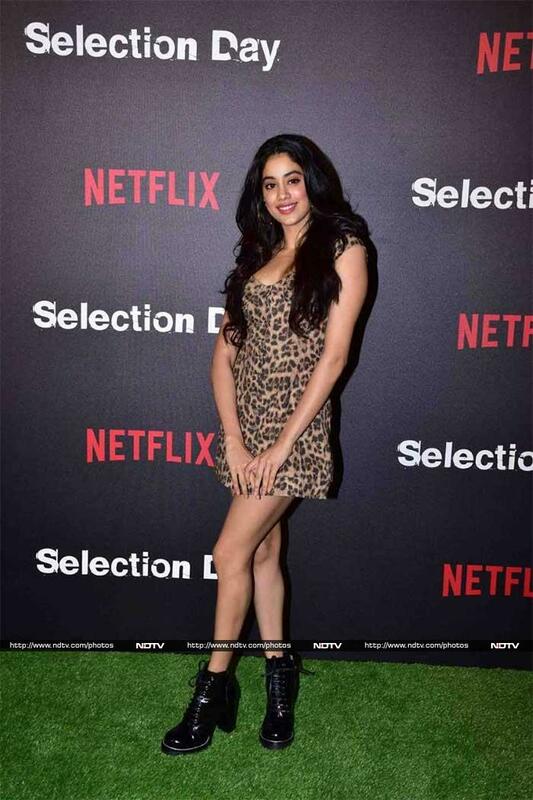 Janhvi Kapoor looked chic in a leopard print mini dress, which she paired with black boots and gold hoops. Janhvi's sister Khushi opted for a crop top and denims, along with sneakers. Rhea Kapoor chose a black pantsuit to wear to the event. Shanaya rocked a sweater-top paired with a white skirt and sneakers. She posed with her mom Maheep Kapoor, who looked fabulous in black top and checked skirt. Anshula Kapoor kept it simple in a printed long dress. Mohit Marwah, Anil Kapoor's nephew, opted for a casual look. Meanwhile, Anil Kapoor looked dapper in a blue suit. Sanjay Kapoor also cheered for his brother Anil Kapoor. Swara Bhasker, who was part of Sonam and Rhea's Veere Di Wedding, was dressed casually in a red top and denims. Sanya Malhotra posed on the green carpet. Farah Khan was also present. The cameras also spotted Kabir Khan at the event. Anil Kapoor photographed with team Selection Day.